Summer Extravaganza is planned for the end of this month - eek!! Newsletters out early next week, but I just wanted everyone to save the date - 27.28.29 July. And of course give you a sneek peek of our fantastic line-up. In no particular order, we have .... Heather Doran, a fabulous cardmaker and stamper who has been published internationally, and featured on the Hero Arts Blog. We also have Eva Birdthistle, a fabulous scrapbooking teacher and Crafting Ireland design team member ...and there is more to come. The Summer Extravaganza is our original extravaganza and has been going for 8 years!!!! Held in the shop, we have to limit numbers so early booking is essential. After lots of chatting and thinking we have decided to run a weekly programme of quality craft classes for kids aged 7-13 over the summer. So .... Every Thursday afternoon, we have some great activity classes which are based around skills as well as making quality items that you will use at home or can give as presents. All the classes will be taught by Kim 'o Donoghue, an qualified art teacher who moved to Ireland from America a few years ago. hereWe have a fab picture with a few sneak peaks, but will be posting more samples on our Facebook page every week. I was delighted to be back in Dublin this weekend, with a new format workshop, in a fab new venue. We made 6 projects - packed with lots of techniques, at the Sean 'o Casey Community Centre, which was light and airy, and very clean and comfy. It was such a relaxed day and everyone got their projects done, each in their own way, with personal twists as we discovered the uniqueness of fabby crafting goodies like alcohol inks and UTEE. Just a few pics to show you what we were up to. Hope to be back in Dublin soon. I have had one of those weeks where the projects to be finished is a bit too long. Good in one way because it is so inspiring, but the big question is to decide what to do first - Class cards for our regular class, the fabby projects for my class on Saturday (doing things Kerry style), a mini-album swop I am doing with some very talented ladies on Facebook, and the next Yellow Club. Today's pic is of a cute card I made for thanking teachers - a really important message at this time of year. Giving gifts isn't as common anymore, but a nice handmade card I know will be appreciated. You could always get the student to do the colouring themselves! The base card is a pre-fold from Docrafts. Sometimes it is just easier when a bigger sheet than an A4 is needed. It is a 6X6" Stepper card. The image is from Penny Black and is a beautiful wood mounted stamp. I have coloured using my Copics, and then created the flowers from scraps. The sentiment is handwritten using a white gel pen! Love this Tim Holtz man! I combined him with a rainbow background which has been brayered using Kaleidacolor ink and a stirp of embossed card - suing the clocks from the Sizzix range. I so need to get back to blogging, have loads of ideas flowing around my head including tutorials and more, and somehow the days tick by and not enough happens ..... I am keeping up with Facebook, with all sorts of updates, competitions and sneak peaks, so do please Like our Facebook page. 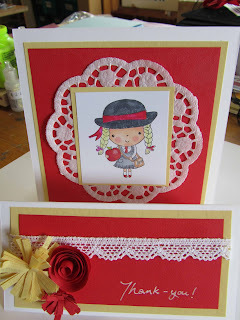 But I also want to get back to blogging, so here are 2 pics of cards I made this week using the latest releases from Sizzix and of course my favourite Penny Black sentiment stamps. For the wedding - or wedding anniversary card I have used a simple colour pallette of white and gold, an embossing folder and these beautiful tag nesting dies from Sizzix. The sentiment is stamped and embossed with gold detail powder. The little friend card is so simple and features new dies from Sizzix that cut swing cards - and economical too as you can get 2 cards from an A4 sheet.